Spring is coming quickly, and dresses on weekdays will be in my regular rotation very soon. But it can be tricky to wear a dress on a normal weekday without feeling overdressed. Wear a pair of sneakers! 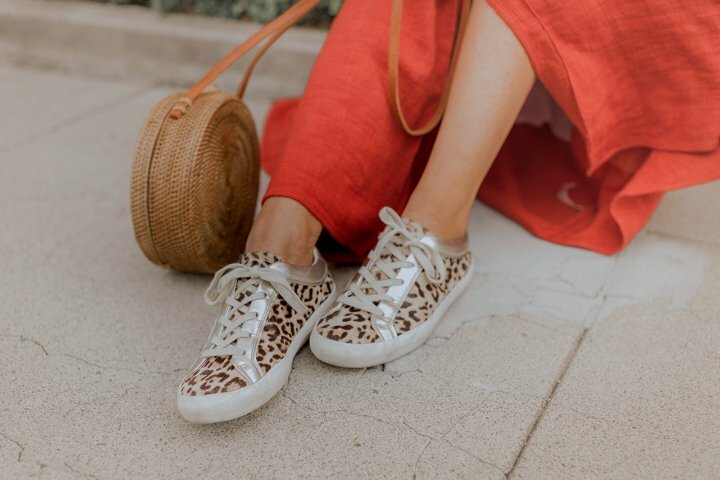 I shared some tips for choosing the right sneaker in this post HERE, and I’m loving this leopard pair that I picked up a couple of weeks ago. They go with everything and add a fun pop of pattern and metallic to a basic dress. This dress is a new favorite, and it comes in so many pretty colors, like blue, cream, and black. 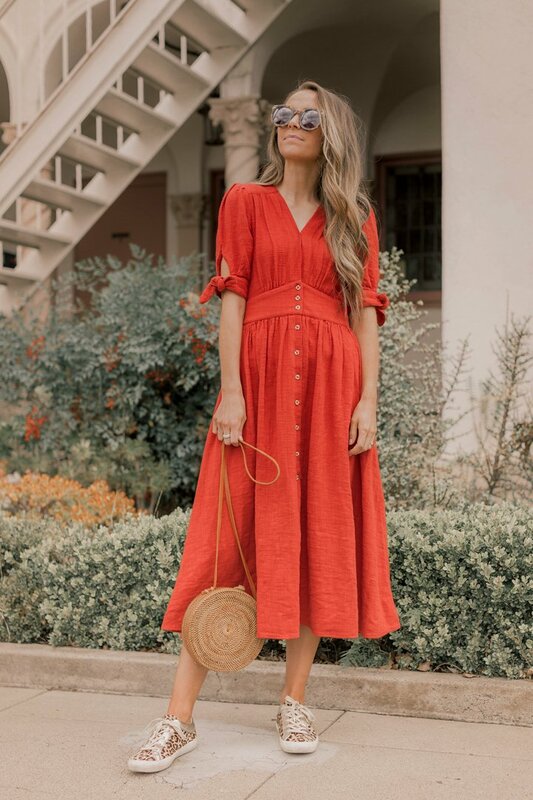 It runs slightly big (I’m wearing an XS and it’s a bit roomy at the waist), but it’s so great for spring and summer and is easy to dress up with heeled sandals, or down with sneakers. You’ll see in the product shot that it has a low neckline, but I just pinned it with a safety pin for a little extra coverage. Check out these other posts with dresses and sneakers paired together! 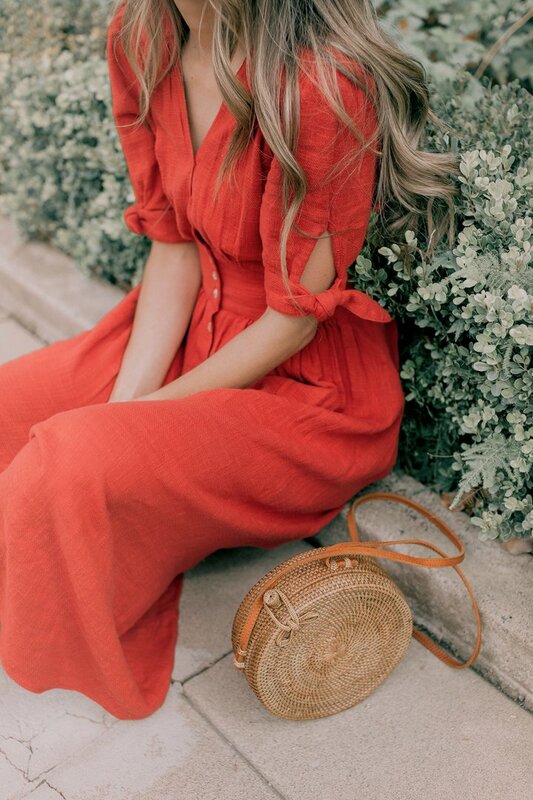 This linnen dress is wonderful and a type of the dress i usually spend most of my summer in! 🙂 You are looking gorgeous top to bottom! Hi Merrick, were you able to put some kind of extra closure on it to make the neckline not so low? If so could you say what you chose so i could have a tailor do the same? thank you! Hi, beautiful dress. Do you mind me asking how easily it crushes? Wow, the dresses she wore looked so beautiful, I also wanted a dress like that.